To hear our students playing grade pieces please click the link above. So why not contact us to enquire about taking an exam. With RGT performance awards you record your exam pieces at our studio. We then produce a CD of it and forward it onto the RGT for assessment, marking and grading. 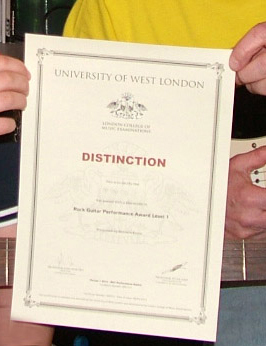 Exam work is all accredited by the London College Of Music and The University Of West London. This could have your name on it in 2018! !